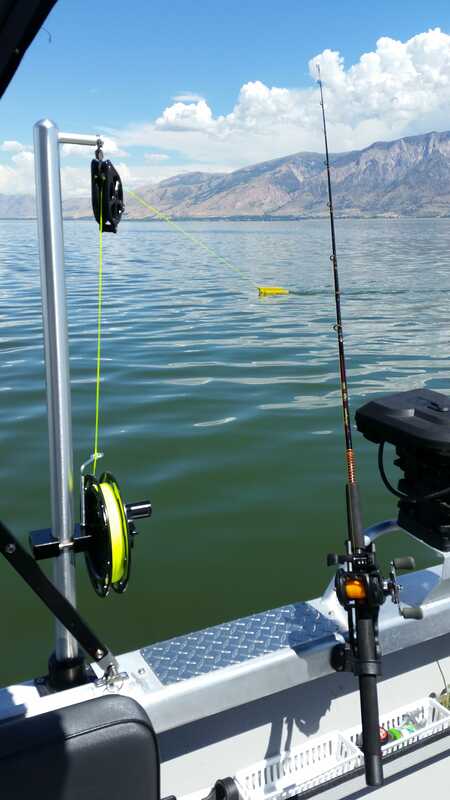 I've heard that when fishing for kokanee this time of year that the kokanee are shallow and very spooky and it is best to use a planner board to get your lure out and away from the boat. Can anyone give me some advice on this and possibly the best way to set one up? I cant tell you much about Kokes but planer Boards are relatively simple. There will be one made for each side of the boat, they will say they are right or left or port or starboard. There are instructions but basically you let out a certain amount of line based on the depth you want to fish, say 50' then attach the planer and attach line to the clip and let it run out to the side as far as you want. When fish hit the planer will move from the side toward the rear of the boat. Reel in line until you can remove the planer. Provided you spell it right. You do not want inline planer boards that is 100% for sure. No fun fighting a fish when one has to drag a planer board in. The rods/rigs I use on the Planer boards for Kokes have a 1oz tungstein slip sinker, a small clear bead, swivel, several feet of fluorocarbon leader, a snap swivel then the dodger/bait. The last time I fished for Kokes I ran a Lakeshore Tackle Dakota Dodger in hot orange on both planer rods, with 12-14" of line between the dodger and a unknown orange spinner rig. I ran these with 50 feet of line out from the sinker/occasionally 60 then off to the mast mounted planer that was +/- 75 feet out from the bow seat post area of my boat. I've only fished Strawberry for Kokes a couple times (900 mile round trip from Vegas) and always late May/early June time frame when they are not as deep (I do not own any downriggers). My catch ratio between rods/rigs out on the planer boards (+/- 12 feet down) and rods/rigs straight out the back of the boat (+/-25-30 feet down with a 3oz snap weight) is fairly even on these trips. Meaning one method doesn't outcatch the other method. The last time we were on the Berry (6/2016) on the last day we caught 39 Kokes between 05:45 and 11:30. +/-50% was caught off the planer board rigs and +/-50% was caught off the rigs running out the back of the boat. I might have a youtube vid of my set-up. I can't remember for sure and can't get to youtube when at work. PM me a reminder if you want me to look and I'll check this upcoming weekend. do a search on this site (BFT) there is a lot of post on how to use planer boards for Kokanee. I just picked up some planner boards this year to try at the berry. I haven’t used planner boards in the past so I was looking at a lot of YouTube videos. I wondered how fun (and effective) it is to reel in the board and the fish on the Sam line. I appreciate you mentioning that. I didn’t even know about the mast setup until reading this post (I love this site). Anyways from what I can see with the mast setup is that the planner board is attached to the mast and the lure is attached to the board by a seperate line. Very smart. It reminds me of the idea b3hind a diwnrigger but instead of going deep it goes out. That got me thinking. Does anyone know if instead of doing a mast if I can just take the weights off my Downriggers and attach the planner boards to them. So instead of running deep with the weights I run away from the boat with the boards. Just trying to think if I can use what I already have instead of building a mast mount for the planner boards. Anyways from what I can see with the mast setup is that the planner board is attached to the mast and the lure is attached to the board by a seperate line. Very smart. It reminds me of the idea b3hind a diwnrigger but instead of going deep it goes out. The mast has a heavy line that goes to the planer. Then you take a clip like what Robert posted/linked to and hook it onto the planer line via the "shower curtain" clip. You pinch open the clip, same thing you do with a downrigger, and put the line in. 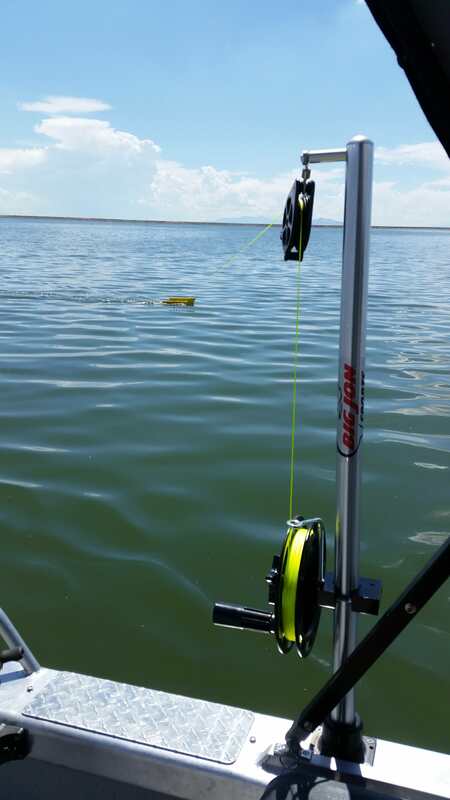 Then open the bail on the reel and let line out until it hits the board. You don't have to go all the way. You can also run multiple lines on one board. Hook one up and let it go all the way to the board. Hook another up and only go half way... Once out of clips I just hand pull the board back in and get all the empty clips back. Back in action again seconds later. The height of the mast helps the clip slide out to the board. If the line essentially has no elevation difference getting the clip like Robert posted out to the board will take a long time if it goes at all since one is going so slow plus the dodger doesn't have a lot of pull. Plus if there is wind thus waves they will catch the line if not elevated. I made my own set-up and really simple. I just removed my front seat from the base post and shoved a several inch wide 6-7 foot PVC pipe into the post. At the top something simple for the 200lb line to feed through and out to the planer. I really like the mast idea. Can I find that setup on youtube? You can find all kinds of stuff in regards to mast planer board set-up. If I have any vids of my simple set-up they are more than likely listed as private so impossible to search for. You have to have a direct link. Something I have to look for this upcoming weekend when I get time. Youtube is blocked at work. can you find that youtube you have on your setup? If you would like to go fishing with me I can show you how I use planer boards. Here is a link to plans I posted 10 years ago to make your own boards. Read through the link for some tips as well. Click here. I'm 76 years young and going as hard as I can for as long as I can. THANK YOU ! the photos are great. Love the Idea and I'm going to do it. Hmm, I swear I had a video somewhere. Even the pics I found on the PC were on the light side for me. Anyways a couple pics that I did find. Basic idea'r is there. $$ wise if one wanted to penny pinch you really don't need the Big Jon planer reel IMO. Not for this application anyways. 75-100ft of the heavy line tied off to the top of whatever type of homemade mast will do. Get going and toss the boards over the side. A couple minutes later all the line will be out and the boards will be ready to use. The only real use I had for the reels was to store the line. Even when I ran out of clips and needed to bring the boards in to get the clips off I just hand pulled them in, removed the clips and tossed the board back over the side. Waaaay faster than reeling them in. On Strawberry I only use 75ft of line. When on Lake Mead doing about twice the speed one does for Koke fishing I let out 100ft of line. Thanks for all the wonderful posts you do! I have learned a ton in the last year from you, and have been very successful watching and learning from you on the koks. With that said, just waiting for Ice off at the berry and gorge and am gearing up for my first planer board setup using your plans. However i am trying to save some money here and was going to build a mast system like the one here in this video, as i did some shopping on the Big John Masts you show and choked on the pricing. I was thinking of mounting a mast like this on the center hole up front of the windshield in the boat, but was wondering about angles and hooking the clips. Do you think the line will angle back enough to hook the clip behind the windshield in an ergonimic way? Or should i build 2 masts one on each side like yours? Do you think a large salt water pole cut down and but into a fish holder clamp would work? Just trying to get some ideas so I dont have to redu something several times to get it to work efficiently. I want to ask you the same question i just asked Bob, as you have the same mast system I was looking to build, and at the same location in your boat. 1. Do you have to go up past the windshield to hook up the scotty clip to the main line? If so, is it a big pain? How to you manage if you have your top up? 2. where did you get the reels, and how much? 3. I purchased some large Penn Salt water reels thinking i could but the planer board line on it? Do you think that will work? Can I use a different line, (smaller diameter) that wwill not chafe? Just getting ideas for the build. When I built my boards back in 2008, I was fishing from a 16 ft Tracker. I didn't want to spend the money for a dual reel mast so I just bought some orange planer board line and took a couple of very stiff lead-core rod & reel setups and replaced the lead-core with the orange line and used them for my masts - one on either side of the Tracker. I used a black marker and marked the line every 25 feet out to 100 so I would always have an idea about how far out I was. I used that system for 2 years until I bout my first mast. I sold the double reel mast with that boat and went with 2 Big Jon singles on my new boat. Mounted at mid ship on both sides, the line is right there to attach the clips without having to use a 5 ft long pole with a hook on one end to reach out, grab the line, and pull it in to attach the clips. The 2 single mast assembly's cost $392 out of Florida. It's only money. The line heading out to the planer board isn't under very much tension at all. Especially going at the speeds one does for Kokes. With that said in the picture below you can see the relationship of the rod to said line. I just reach out and grab the line by one of the eyelets on the rod and pull it to me. Zero issue/concern about rod damage. Like I said there is very little tension pulling it down to you (plus the line is angling back) and there isn't much travel needed to get it into hands reach even around the Bimini when up. I did the same as Bob. Marked the extremely bright line with a sharpie every 25 feet so I know how much I have out. IMO... There is zero reason for spending the $$$ needed for a Planer reel. At least initially/until you know how much you are going to use it , etc. Just have 75-100 feet of line at the mast for each side and just toss the board over the side plus the line and let it stretch out. For the amount of times I have used mine I wish I hadn't spent the $$$ for those reels in hindsight. +/- 100 each several years ago off Amazon (120 now on Amazon). You can order off Amazon Bert's custom tackle mast line. 200ft/200lb for under $22 bucks shipped free if a Prime member. There is some other brands and lengths available on Amazon too. These are the boards I used. Work great . Big suckers to lug around though. Certainly nothing I keep/store in the boat unless I know I am going to use them 100% for sure. Cheap and more personal route is certainly Bobs directions to making your own. Well you guys saved me over a couple of hundred bucks right there. The store bought planer boards and storage are going back. Gonna build me that redneck planer mast for about $35 bucks, and the home made planer boards from Bob's plans are already in the works. I figure i will use them more in early season, so why not save the $$ for more pressing things. I fished the inlines for years and lost a big fish fighting the board after that I built the boards off Bobs plans and I have never looked back. Like others have stated I have about 100 feet of line and I just throw the board out and hook the end on a cleat. I wind the string up around the all thread at the end of the day. No more Fighting the board for me.